What is the significance of the Bon Jovi album title 7800 Fahrenheit? The album's title was a reference to the supposed melting point of rock. What famous singer-songwriter met his future wife when he was working as a nightclub bouncer...and threw her out for fighting? Garth Brooks. His wife, Sandy Mahl was in the nightclub's ladies' room when she threw a punch at the jealous ex-girlfriend of a man she had dated and her hand got stuck in the wall. Brooks, a college student at the time, freed her hand and threw her out. He later began dating her. What flamboyant pop star auctioned off his costumes for $8.2 million in 1988, explaining "I don't want to go on stage looking like Tina Turner's grandmother anymore"? What singer-songwriter owns the publishing right to 'Stormy Weather' and 'Hello Dolly', as well as the soundtracks of Grease, Mame, Annie and A chorus Line, among many others? 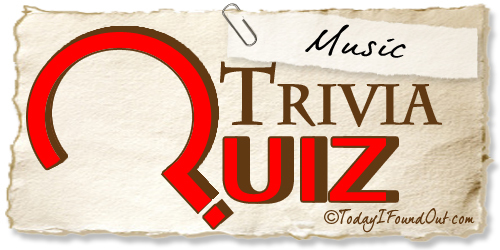 In April, 1971, which rock group became the first ever to appear at New York's Carnegie Hall? What song holds the record for the biggest leap to the number one position on Billboard's Hot 100 chart? The Beatles' "Can't Buy Me Love." On March 28,1964, it entered the chart at number 37, the next week, it was number 1. How much did RCA record pay Sun Records for Elvis Presley's contract in 1955? RCA paid $35,000 plus a $5,000 bonus when Elvis signed. In addition to Michael Jackson, who were the original members of the Jackson Five? What was Beatle John Lennon's middle name? What rapper's real name is Robert Van Winkle? Robert Van Winkle is VANILLA ICE not ICE CUBE! @Carlo Galante: Yep, accidentally selected the wrong one in the quiz question admin panel. Thanks for catching it!